A failed Republican effort in the House to cut NLRB discretionary spending by nearly half could set the groundwork for future discussions about reeling in the authority of the labor agency. House lawmakers last month rejected an appropriations amendment that would have slashed the National Labor Relations Board’s funding to $150 million from the $274 million for fiscal year 2017, which ended Sept. 30. The effort could energize future attempts at curbing the agency’s power, according to some House Republicans and fiscal conservatives like Pete Sepp, president of the National Taxpayers Union. The amendment to the FY 2018 Labor-HHS bill, introduced by Rep. Glenn Grothman (R-Wis.), is one of the latest attempts to change the agency that was formed as part of the New Deal. Some Republicans argue that shrinking caseloads and high-profile partisan rulings beg for changes to the NLRB, and they often propose cutting tens of millions from its budget. That includes a GOP bill in 2014 that would have essentially dismantled the NLRB, transferring its duties to agencies like the Department of Justice. Republicans are also seeking changes from within the NLRB, with optimism fueled by the five-member panel recently shifting to GOP-majority for the first time in about a decade. This comes as the Trump administration and the GOP-controlled Congress have sought to undo what they describe as job-crushing rules and laws during the Obama administration. As for Grothman’s amendment, the lawmaker argued that his proposed 45 percent funding cut in part was needed to adjust to the NLRB’s decreasing caseload from prior decades. House Democrats and some labor union leaders argue that reducing the NLRB’s funding would thwart the board’s ability to enforce the National Labor Relations Act. The 1935 law protects the right of employees to engage in collective action to improve wages, benefits, and other terms of employment. Cuts Needed Amid Decreased Caseloads? Before the Sept. 13 floor vote, Grothman argued that the large NLRB cuts were needed amid a decrease in NLRB caseloads and what he described a spate of partisan-led case rulings, such as new union election procedures that have thwarted some economic growth. “Since it’s inception, the NLRB has served as a partisan board that has flipped ideology from one administration to the next, often cutting businesses off at the knees and stifling economic growth,” he said. In addition to the new election rules, Republicans and employer advocates have strongly opposed Obama-era rulings such as expanded joint employer liability for affiliated businesses, as well as a board decision critics say allows workers to form “micro-units” within a larger workforce. 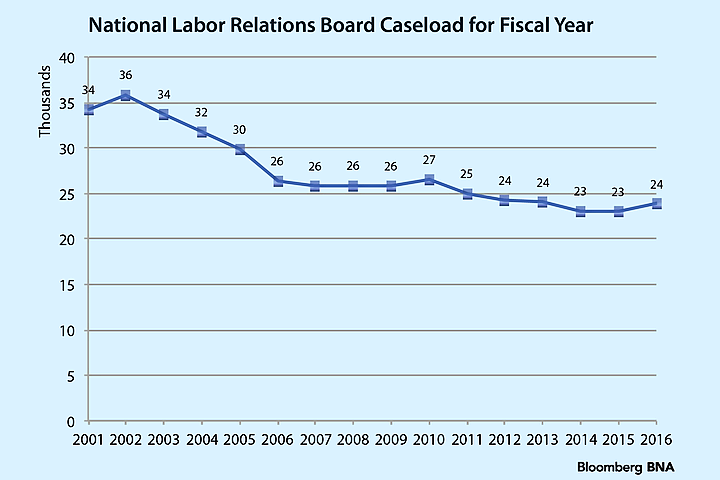 A Bloomberg BNA review of NLRB data shows the agency’s caseloads have generally been steadily declining. For example, in FY 2016 the agency had an intake of 23,863 cases, which was about 1,000 more than the previous year but down by more than one-third compared with FY 2001. Unfair labor practice cases remain the largest share of caseloads for the agency, which has seen union representation cases down by more than half compared with FY 2001. The NLRB’s yearly performance reports have said the caseloads fluctuate depending on several factors, such as employment trends and corporate reorganization. The board’s number of full-time employees has also been steadily shrinking, to 1,596 in FY 2017, nearly 400 fewer than in FY 2001. Those such as Tami Lee, an assistant professor in the Rutgers School of Management and Labor Relations and a former NLRB attorney, argue caseloads shouldn’t spur cuts. Lee said the agency’s funding was increased in the past years to tackle case backlogs. Employee pay, benefits, and office rent generally make up more than two-thirds of the overall costs for the NLRB. That means large-scale cuts would have to be accomplished by measures such as furloughs. Grothman’s amendment gained votes of 175 Republicans during the Sept. 13 floor vote. A total of 241 lawmakers voted against the measure, including 52 Republicans, among them the chair and vice chair of the House Education and Workforce Committee. 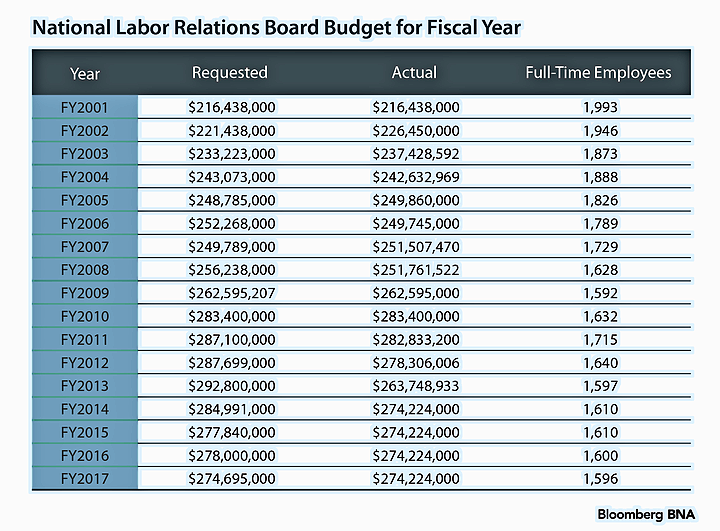 The GOP-controlled chamber followed by approving the Labor-HHS bill, which does decrease NLRB funding by about $25 million, which is about $9 million deeper in cuts than the Trump administration was seeking. Could More Defunding Attempts Follow? Grothman’s attempt at a large-scale cut at the NLRB could spark similar efforts in the Senate, Sepp said. Grothman and his staffers didn’t respond to Bloomberg BNA’s requests for comment. A spokesman for HELP Chairman Sen. Lamar Alexander (R-Tenn.) also didn’t respond to Bloomberg BNA’s request for comment. The Senate has yet to hold floor debate on its proposed Labor-HHS spending bill, legislation that would keep the NLRB budget unchanged from FY 2017. Alexander and HELP ranking member Sen. Patty Murray (D-Wash.) are both members of the Senate appropriations committee, which approved the proposed appropriations bill earlier this year. The House version of the Labor-HHS bill will eventually have to be reconciled with the Senate version. President Donald Trump recently signed a resolution that continues funding the federal government through Dec. 15. Education and Workforce Committee Chairwoman Rep. Virginia Foxx (N.C.) was among those who voted against the steep spending reduction. Republicans may want to wait and see how the new GOP-majority board operates before getting serious about any budget cuts. Grothman is also a member of the committee. Rep. Bradley Byrne (R-Ala.), the Workforce Protections subcommittee chairman, voted in favor of the amendment. He told Bloomberg BNA he’d like to see some core changes at the NLRB. Byrne, a former labor attorney, said Congress needs to make changes to the NLRA and look at restructuring the NLRB to keep regional offices in place to investigate alleged labor law violations, but dissolve some of the other parts of the agency. That includes shifting at least some of the board’s activities to federal courts. Proposed reduction of the agency’s footprint draws criticism from some Democrats and labor leaders, such as Mark Schneider, general counsel for the International Association of Machinists. The NLRA needs to be updated to a changing workplace, Schneider said, but he criticized a proposed reduction of the NLRB budget. “Their budget proposals speak volumes about where their true priorities lie, and we will fight the Congress and the president on this budget as we will fight them whenever they target working people as they struggle to capture their fair share of the American dream,” he told Bloomberg BNA Sept. 19. — Jasmine Ye Han contributed to this story.